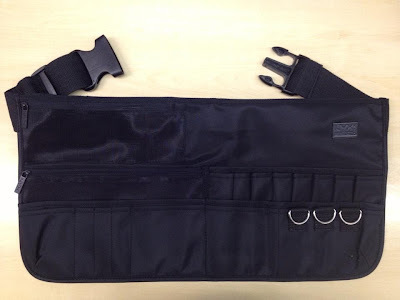 I'm so happy and excited to receive this brush belt today. NYX L.A. is town to prepare for NYX launch in Sephora Singapore in August this year. I have a leather brush belt which I got from Stage back in year 2010 but the design is a regular brush belt design where most of the compartments are meant for brushes. As I use airbrush most of the time, I don't need too many brush slots. Hence, when I saw this brush belt in NYX 2013 catalogue, I fall in love instantly. It's just exactly what I need. There are many compartments and some with zipper too. There are 3 key-rings attached. At the back, there is another pocket with zipper which I can slot in cash / card while on set. A handy tool that will definitely be my companion for a long time.